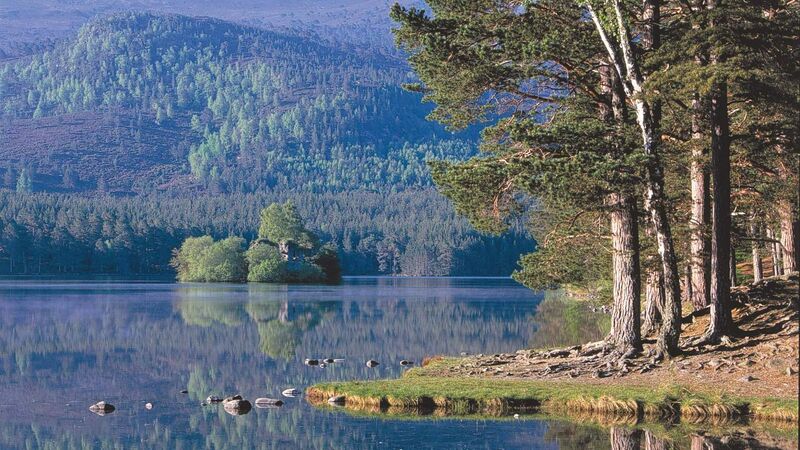 Hidden in the forest of Rothiemurchus is Loch an Eilein, one of the most special and loved places in Scotland. The mirror-like water, ancient pine trees and mountain views are all part of the charm but it’s the 13th century island castle in the middle of the loch that’s the real jewel in the crown. Loch an Eilein translates from Gaelic as “Loch of the Island”. Read on to find out more about this fascinating castle and it’s history. 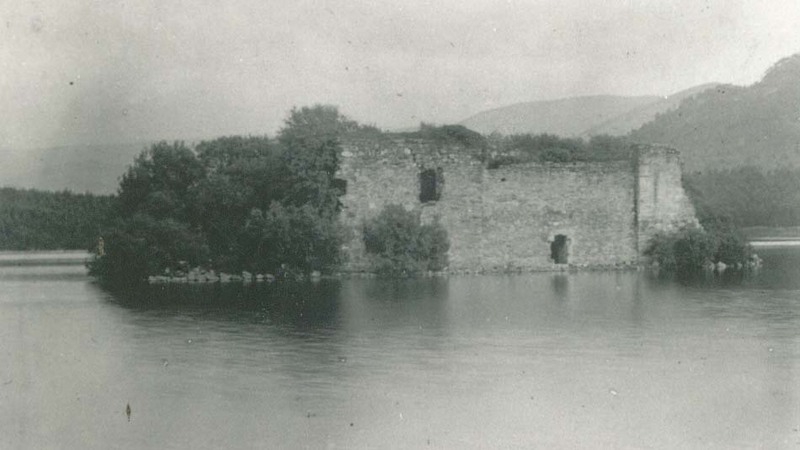 The ancient castle on the island was built on a natural defensive site. Its origins are uncertain, however it is thought that between 1222 and 1298, the Bishop of Moray chose the south end of the island to build a half house surrounded by a defensive wall. In the 1380s, the notorious Wolf of Badenoch (Alexander Stewart, a younger son of King Robert of Scotland and Robert the Bruce’s grandson) probably constructed a sturdy tower house as a fortified hunting lodge on the north end of the island of 10m x 8.5m with walls 1.8m thick. It also had a barrel-vaulted cellar, first floor hall and upper chamber. 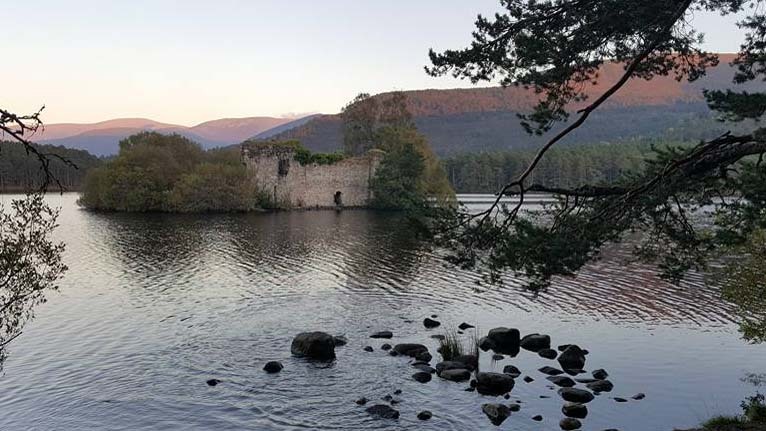 In 1600 Patrick Grant of Rothiemurchus built a connection curtain wall between the hall house and the lower tower to increase security in emergencies. These are the ruined structures you will see today, made so by winter storms despite minor repairs early last century. The island, on which the castle sits proudly, decreased in size in the 1770s when a sluice built to enable felled timber to be floated down the Spey, raised the water level. The water now obscures the zigzag causeway once said to connect the castle to the shore. The most notable skirmish to take place was in 1690, when the defeated Jacobites from the Battle of Cromdale besieged the castle. Furthermore, in 1745 after the battle of Culloden, the widow of 5th Laird Jean Gordon, (alias Grizel Mhor a well known Jacobite Lady), sheltered fugitives in the castle. More recently Grant lairds have also used the island loch to protect Osprey nests on the castle.